This blog post was originally published in junpierre.net/words. I am currently working on a series of paintings based on Greek myths that have been a lot of fun to work on. The myths are exciting and dramatic and they lend well to personal interpretation. It’s no surprise that artists through out the ages have been inspired to recreate the myths in their own eyes — Titian, Velazquez, Caravaggio, and Botticelli just to name a few. Among the paintings I am working on are the twelve labors of Herakles. The twelve labors interest me because of the wonderful array of challenges that Herakles faces. Each adversary is so colorful, often times more interesting than Herakles himself. It also fascinates me how Herakles, the greatest of heroes in Greek mythology, takes on so many different roles throughout the twelve labors. Whether he is a hulking brute, a cunning strategician, a sly charmer, an overwhelmed underdog, or a menacing predator Herakles always comes out in the end as the heroic champion. 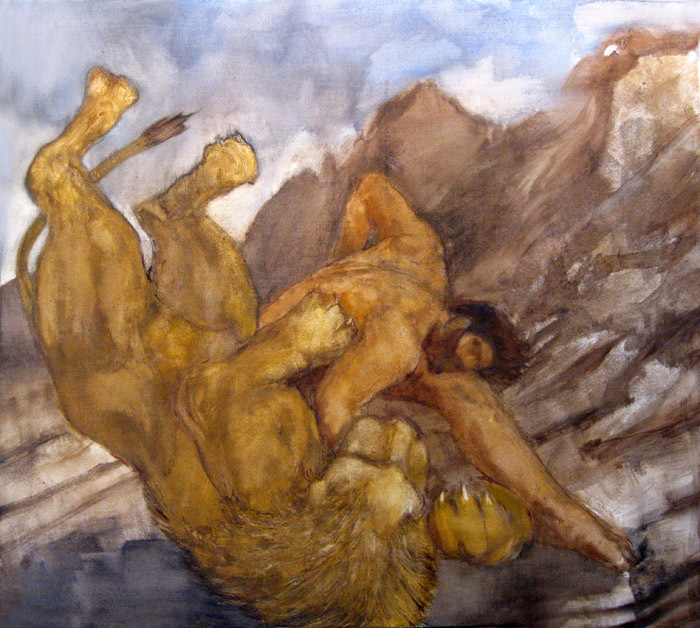 Herakles first labor is to hunt and kill the Nemean Lion. Of course, Herakles is successful in his mission, and from then on wears the lion’s own impenetrable pelt (which he skinned by using the lion’s own claws) for his subsequent adventures. For the lion, I wanted to show that it was a powerful, formidable foe with clearly defined musculature. I looked online for some images of feline anatomy and did some sketches. The best reference I could use however was from the book ANIMALS: 1419 Copyright-Free Illustrations of Mammals, Birds, Fish Insects, etc. A Pictorial Archive from Nineteenth-Century Sources by Jim Harter. I continued this and tried to substitute one of the figures with a lion to see how that would look. Clearly I had moved away from the circular idea for the composition, but the figures were still considerably intertwined. Also there was a lot more movement and energy which I liked. After this last sketch, I was ready to start the painting.I didn’t take any pictures as I was actually making the painting, mostly because I worked too fast. Since I was painting pretty loose with a lot of paint thinner, I had to work fast because although it was an oil painting it actually was drying quickly. I ended up doing the painting in one shot over the course of a day. My objective was to move and push the paint around in a way where it didn’t seem too controlled and it retained the energy of a sketch, while having the resolution and impact of a finished painting. 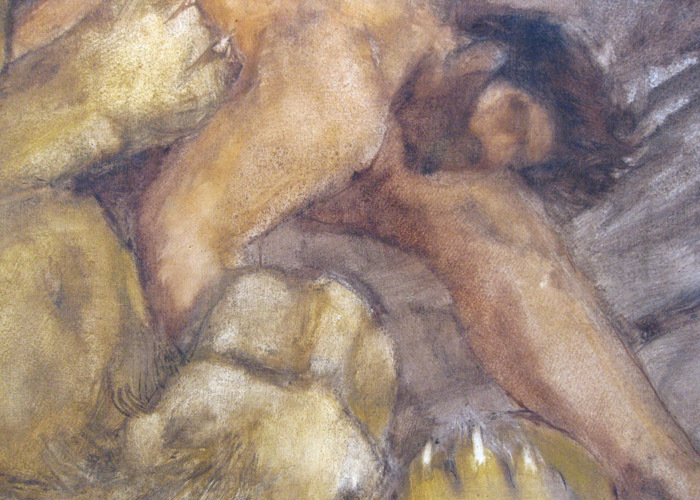 I was hoping that you would make other paintings of Hercules 12 labors- where can I find pictures of them and descriptions? WHat were your motives for painting this piece of art? You are currently reading Development of a Painting: Herakles and the Nemean Lion by Jun-Pierre Shiozawa at The Chronicle.